Information on Adonis provides little to commend a parallel to Jesus.2 There is a death of Adonis in the literature, but it is caused by a wild boar, and there is no doctrine of redemption associated with the death. In addition, this story is found in a text dated to the second century—too late to influence the story of Jesus. This particular figure is not a pagan savior, but rather, a wandering teacher and philosopher who lived not long after the time of Jesus. Allegedly, there are parallels to be found in the acts and lives of Apollonius and Jesus: Both cast out demons, raised the dead, went on trial, performed miracles, and taught amazing wisdom. The value of such comparisons is simple to determine: Though he lived in the second half of the first century—not long after Jesus—the records we have of Apollonius performing these Jesus-like feats were written no earlier than 217 A.D., some 190 years after the crucifixion of Jesus. The only extant biography of Apollonius was written by Philostratus, who was born around 172 A.D., and this source is “full of historical anachronisms and gross geographical errors”6, and makes use of imaginary official letters, inscriptions, decrees and edicts.7 The Gospels have been cited for minor geographical and historical errors, some of which have suitable explanations, but none may be described as “gross,” and they have never been found guilty of faking official documents. Mythicists also hoist themselves upon an uncomfortable petard in making use of Apollonius: Apollonius does not enjoy the level of secular attestation that Jesus does, and so if they accept Apollonius as a historical figure, consistency demands that they do the same for Jesus. Indeed, one of the most radical critics of Christianity in ages past, F. C. Baur, argued for an “Apollonius myth.”8 The earliest historical reference to Apollonius comes from Cassius Dio’s Roman History, 68:17, which was written somewhere between the late second and the early third century, around 100 years after Apollonius lived. Interestingly, Apollonius is given less space within Cassius Dio’s work than Josephus gave to Jesus. Baal is sometimes reckoned as a “dying and rising god,” but the tablets describing Baal’s story do not actually preserve an account of Baal’s death and supposed return to life. A portion of the tablets is lost, and the events are inferred from remaining parts of the story. In what we have left, Baal is discovered dead and given a burial, but later in the narrative, he reappears alive. In another story, if a certain verb is read as passive, it may refer to Baal as “brought to life,” but it may also be an active verb describing Baal as one who “brings to life.” In more than seventy other texts about Baal, there is no mention of his death. Balder is a deity associated with Norse legend and is not documented any earlier than a thousand years after the time of Jesus. 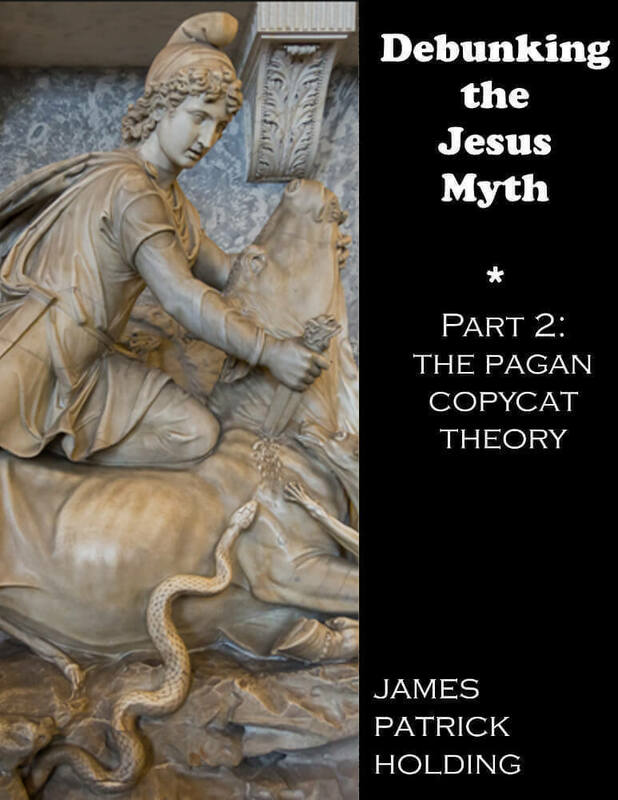 Strangely, mythicists are not reluctant to list Balder as a “pagan Christ,” who somehow influenced the story of Jesus, or proves that Jesus was a mythical figure. Various stories of this Irish hero describe such amusing adventures as having to be plunged in three vats of cold water to cool down his battle frenzy; in the first two vats, the water boils away before he can be cooled down. Needless to say, Irish epics would have been written far too late to influence the story of Jesus. As with Beddru, this one appears to be simply made up. Crite is not mentioned in any scholarly sources on ancient mythology. This figure (whose name is also spelled “Dazhdbog”) was the son of the sky god Svarog, the brother of the fire god, and was also in charge of happiness, destiny, and justice. He superseded Svarog as head of the pantheon, and was identified with the sun. During eclipses he was thought to have been devoured by wolves. He was served by two maidens who represented the auroras, and the moon was his uncle. In some stories, he gets married and he and his wife Mesyats beget the stars. The Serbs have a story where he gets older as the day goes on, and is reborn every day.13 I think it is fair to say that this sounds nothing like the story of Jesus. Several claims have been made of Prometheus by mythicists, like: He descended from heaven as God incarnate to save mankind. This is false. Prometheus was a demigod, a Titan, one of that mythical race that was at enmity with the Greek gods. To say he was “incarnate” is incorrect—unless we expand that definition to include the Greek deities coming down in human form (or in Zeus’ case, swan form, or bull form, or the form of any other creature). Prometheus’ “incarnation” was also of no theological significance. Nor did Prometheus save mankind in a Christian sense. He provided fire and other practical gifts, so he was man’s protector and benefactor, but he didn’t “save” as Christ saved. He had a special friend, “Petraeus” (Peter), the fisherman, who deserted him. I find that the only place a friend named Petraeus is mentioned is in a passage from the work of Robert Taylor. Taylor was a 19th-century apostate clergyman imprisoned for blasphemy who, while incarcerated, wrote a book titled Diegesis, as a refutation of Christianity. Unfortunately, because he was in prison, Taylor seems to have worked a great deal from memory and made a number of serious mistakes. Elsewhere, Taylor claims that his “Petraeus” is to be found in the play’s character Oceanus, for “Petraeus was an interchangeable synonym of the name Oceanus.”16 No justification is offered for this claim of synonymy, and in any event, Oceanus does little in the play other than have a brief conversation with Prometheus, and then he departs, as do many other minor characters who talk to Prometheus. He was crucified, suffered and rose from the dead. This is false. Prometheus was not crucified, but shackled to the side of a crag, high in the Caucasus Mountains as an eagle was sent each night to tear at his immortal flash and devour his liver, which would grow back each night. He could not have risen from the dead because he was immortal. He was called the Logos or Word. If he was, no one in Greek mythology knows about it. The closest I have found to this is that Plutarch apparently called Prometheus “reason,” which is the Greek word logos, but he used it in an entirely different sense than was applied to Jesus (as a hypostatic entity of God the Father—a member of the Trinity). Reading the evidence shows that the impact of Spanish colonial processes generated a heated, pressurized, dangerous social atmosphere which penetrated the sixteenth-century transmission of indigenous historical and religious traditions, to the extent that almost all of the available documents contain alterations in the picture of pre-Columbian life...it is clear that a thick Spanish, colonial Christian gloss has been brushed across the ideas, symbols, and dreams of ancient Mexican culture. Carrasco notes the example of a pre-Columbian storybook, and the same material “presented in European style prose histories...often with Christian polemics and interpretations inserted.”18 Moreover, Carrasco notes that only 16 authentic pre-Columbian documents survive…the remainder were destroyed by the Spanish. This fact alone renders all attempts to parallel Jesus and Quetzalcoatl suspect. Mythicists will need to find pre-Columbian sources that verify their contentions. As it is, they do not do so. They rely overwhelmingly on the later “suspect” works of the revisers who tried to make Mesoamerican religion more “Christian” in taste. For this reason, we deem it necessary to only consider a few mythicist claims about Quetzalcoatl. Was represented by three crosses, one larger and two smaller, and was depicted as bearing the cross as a burden, and with nail holes in his feet. The closest we get to this in pre-Columbian evidence is in the Codex Borgia20 with a larger scene in which Quetzalcoatl is having his heart extracted by two other deities. Quetzalcoatl is then “taken to the underworld and to a ball court,” and is next seen on a “cruciform device” (in the shape of a X, not a T), “with five little images of Nanahuatzin, the dead and cooked god of lechery and the evening sun, emerging from his four limbs and his heart.” Diaz and Rodgers note one interpretation of this scene as Quetzalcoatl transforming into Xolotl-Nanahuatzin. other deities (Xblanque and Hunaahpu) who are associated with Venus, and Venus is variously associated with war, or concepts of the primordial day, or sacrifice. Given the prominence of Venus in the Northern Hemisphere it would hardly be a striking coincidence if it was appealed to for some sort of royal imagery by more than one culture. He annually died (sacrificed in the Temple in Jerusalem) and was resurrected. At a sacred time of his passion in Jerusalem, wore a crown of thorns made of myrrh. Was called “only-begotten Son” and “Son of the Blood”; as well as Healer, Savior, Heavenly Shepherd, and Anointed One. What I have found offers utterly no confirmation of, or reference to, any of these claims, with two exceptions: Tammuz’ identity as a shepherd, and his death and “raising.” Tammuz was known as a Sumerian god of fertility and of new life earlier than 3000 B.C.23 He was indeed known by two of the names above: he was called a shepherd, but that was only because he literally was a shepherd.24 His specific charge was the production of lambs and ewe’s milk. Of course, in a pastoral ancient society, it would be no surprise for any leading figure (political, religious, or whatever) to be called a “shepherd,” but in this case the parallel isn’t even there, because the title is literal. Tammuz was also called a “healer” (as a profession), and regarded as a savior, but as Langdon notes25 those who referred to Tammuz by these names “have not those spiritual doctrines which these words convey in Christian doctrine” in mind, but use the words “in the sense that all life depended upon his sacrifice and especially upon his return from hell.” This means physical, not spiritual life: Tammuz healed medically, but as Langdon reminds us, “[e]very deity, male or female, possessed this power,” so Tammuz is not unusual in this regard. Tammuz saved, but not from sin: He saved from starvation and physical death. He was never looked upon as one to rescue from eternal damnation. His other titles include “Mother-milk,” “god of date palms,” and “image of Ea.” Tammuz’ death occurred at the end of spring; he was killed in one story by the gods of the thunderstorm, and the story is so told that the “return of the god seems no new beginning: it is more we who are back to the old beginning.” The death and “raising” of Tammuz occurs every year and corresponds with the natural cycle of vegetation. This provides no parallel at all for the Christian religion, expect by redefining terms into meaninglessness (that is, “resurrection” meaning not just a specific Jewish concept, but any dead-alive transition), thusly ignoring vast differences in meaning. There is also a writer who said that the mourning women didn’t eat of ground grain, because it “is the body of Tammuz,” but this writer was from the medieval period30 and so his words cannot be used to identify an analogue to the communion ceremony. Also, some make much of Tammuz’ alleged symbolization with the tau, or T, as a supposed parallel to the cross, but no one was impaled on Tammuz’ alphabetic symbol, and it is doubtful that the Romans and Persians crucified tens of thousands of people on such a shape because they saw it used by Tammuz and decided that it was a good shape to crucify people on. Langdon, though not a mythicist, repeatedly refers to Tammuz’ “virgin mother.” He refers to the earth, not a female figure who literally gave birth to Tammuz. Langdon also does not suggest a parallel or influence with respect to Christianity. The declaration of the site of Christ’s birth, as sacred to Tammuz, was therefore a Roman reaction to Christianity, and did not involve Tammuz’ birth. This particular alleged savior figure is an unknown outside of lists derived from the mythicist Kersey Graves. The Bonzes do exist; they are a type of priest or monk in the Eastern world…but who or what Zoar may have been is not to be found in any scholarly source. The conclusion—the pagan Christ “minor leagues” lineup, is down and out for the count. Claims about these figures may be found in a variety of sources, in print and online, but all seem to have, as their ultimate source, Kersey Graves, World’s Sixteen Crucified Saviors (1876). Mark Smith, Origins of Biblical Monotheism (Oxford University Press, 2003), 116. Timothy Freke and Peter Gandy, The Jesus Mysteries (Three Rivers Press: 2001), 29, 248. I find no mention of a “virgin mother” for Adonis in sources like Mike Dixon-Kennedy’s Encyclopedia of Greco-Roman Mythology (Santa Barbara: ABC-CLIO, 1998). David Cartlidge and David L. Dungan, Documents for the Study of the Gospels (Philadelphia: Fortress, 1980), 205. G. R. S. Mead, Apollonius of Tyana (Chicago: Ares Publishers, 1980), 48. Originally published 1819. Smith, op. cit., 104, 120, 128. Andy Orchard, Dictionary of Norse Myth and Legend (London: Cassells, 1997), 12-13. <http://www.truthbeknown.com/beddru.html> Accessed April 22, 2008. As Don Harper, contributor to this volume, has noted, in Chapter 1 of his book, Kersey Graves lists “Budha Sakia of India” and “Beddru of Japan” as separate entities from different locales, and in further chapters (7 and 38) gives them completely different origins. Mike Dixon-Kennedy, Encyclopedia of Russian and Slavic Myth and Legend (Santa Barbara: ABC-CLIO), 61-2. “Deva Tut” is listed as one of innumerable (alleged) names for Buddha by Geoffrey Higgins’ Anacalypsis (i:5, 153). James McKillop, Oxford Dictionary of Celtic Mythology (Oxford University Press: 2004), 171-2. Also of note is that several popular Mormon apologists (professional Mormon apologists do not follow on this) willingly accept parallels between Quetzalcoatl and Jesus, and use them to support their view that Christ visited the Americas. David Carrasco, Quetzalcoatl and the Irony of Empire (University Press of Colorado, 2001), 12. Enrique Florescano, The Myth of Quetzalcoatl (Baltimore: Johns Hopkins University Press, 1999), 39. Gisele Diaz and Alan Rodgers, The Codex Borgia (Dover Publications, 1993), xxvi. Thorkild Jacobsen, ed. Toward the Image of Tammuz and Other Essays in Mesopotamian History and Culture (Harvard University Press, 1976), 28; Stephen Langdon, Tammuz and Ishtar (Oxford: Clarendon, 1914), 2-3. Jacobsen, op. cit., 29, 54.